Okay, I'm kind of bored and has nothing to do during reklam (commercial break) while watching my favorite Turkish reality TV show Survivor, so I am here to share a few things about Turkish food, one of the most interesting things to explore while in Turkey. Since we arrived here the last week of March, our weekend adventure always evolved around food whether it's a trip to a restaurant located at the mountain top, picnic and barbecue to a riverside or a cooking session with my mother-in-law at home. This my 4th time to visit Turkey yet there is always a new thing to try or discover everytime. First off, let me introduce lahmacun otherwise known as the Turkish pizza. It is a baked thin dough topped with minced meat mixed with some spices and herbs. 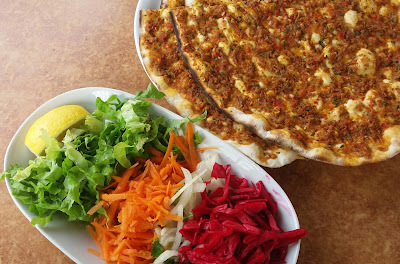 Lahmacun is typically served with salad on the side and is eaten by putting a portion of the salad in the middle, squeezing some lemon and rolling it. Fried breaded hamsi. 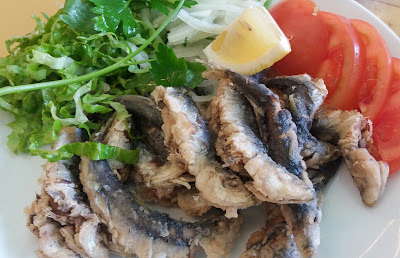 I had this at a lokantası (local resto) somewhere in Edremit. Nothing special. This one is similar to what Pinoys call as tamban. 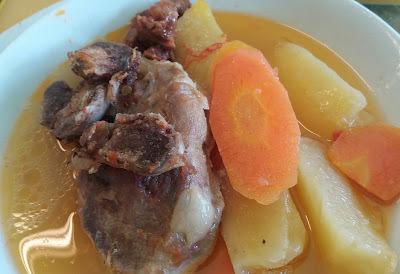 Lamb stew. I forgot how the locals call this tho. The lamb meat is very soft. The broth is a little spicy. This is comparable to the Filipino sinigang, only less in vegeteble. 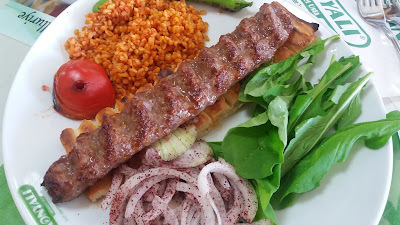 This dish is called Adana kebab, my all-time favorite next to Kofteci Yusuf's meatballs. It is often served with bulgur pilav, bread, grilled tomato and green pepper and salad. This is made from ground meat mixed with some spices, pressed into a metal skewer and grilled to its perfect goodness. Almost 12 midnight now so I'll leave you drooling. Till next time. Lol. My firstborn used to throw funny lines when she was still a little girl and I remember documenting some of it here. 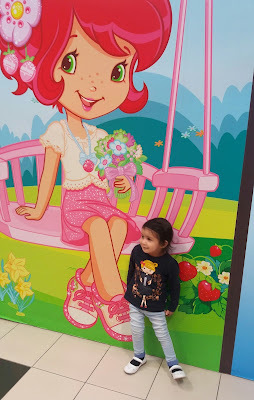 This time I have a talkative toddler so I'm sharing some of her funny stints as to mark this milestone of hers. Note: My baby daughter is 2 years and 9 months old. Suna: Yes, very good, Mama!! Askim: Good morning, Suna! Are you happy? Suna: I'm not happy. Big girl ako! Me: Suna, here's your vitamins. Open your mouth. Me: Okay, so which one do you like, taking a shower or vitamins? Suna: Ahh.. (opens her mouth).